After 4 years of supplying fresh baked scones to coffee houses and restaurants in Westchester County, NY, we're proud to offer a selection of our scones, made to order, in any of 7 delicious varieties to people all over the United States. Our egg-free scones are made in the old-fashioned way, by hand, using only the most natural ingredients around. 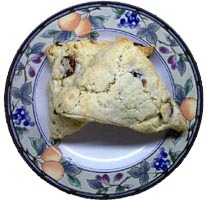 The large scones ($2.50) are approximately 4 inches on each side and weigh about 4 ounces. The small scones ($1.25) are approximately 2 inches on each side. Half the size, half the price! Happy Holidays from all of us at HomeGourmet! To send us comments, questions, complaints or suggestions, click here.